Modern proteomic tools are essential to understand biological questions. The Mass Spectrometry & Proteomics Core Facility provides IRB Barcelona researchers and external users with a number of mass spectrometry-(MS) and proteomics-based techniques that can help to further their knowledge of disease, pathways, targets, and drug effects. Set up in September 2007, the Facility currently offers state-of-the-art applications in Structural MS (studying protein structure and protein complexes and their dynamic interactions), Top-down Proteomics (characterising intact proteins, namely proteoforms), High-throughput post-translational modifications (PTMs) analysis, Quantitative Proteomics (differential expression protein analysis, multiplexing strategies and targeted strategies), and Affinity MS (studying non-covalent biopolymer interactions). The Facility provides consultancy services that cover the requirements of any scientific goal that calls for the use of MS analysis, from experimental design to result validation and interpretation. Feedback from users is considered crucial input for the continuous improvement of the Facility and its services. Samples are analysed either directly by Facility staff or by researchers (previously trained by facility members), who can use mass spectrometers through an open-access system. The Facility team understands the service provided as being dynamic and requiring the continuous development and implementation of state-of-the-art methods and technologies in response to user needs. To reach these objectives, it pursues method development and subsequent implementation. Equipped with high accuracy and high resolution mass spectrometers, the Facility has recently installed an Orbitrap Fusion Lumos, which allows challenging proteomics applications such as the analysis of low level PTMs, quantitative approaches using isobaric tags or metabolic labeling, as well as intact protein analysis and top-down characterisation. The Facility has extensive expertise in method development for the identification and characterisation of various biological species, from small molecules to large biomolecules (e.g. intact proteins and in data interpretation and large data set analysis). Non-covalent protein-protein and protein-ligand interactions are also studied by MS and Ion mobility coupled to MS (IM/MS) in order to gain insight into the mechanisms of action of these proteins in biological processes. Since its establishment in 2007, the Facility has achieved two MS grants. The first is through a COST Action (European Cooperation in the field of Scientific and Technical Research-COST) awarded through the Horizon 2020 Programme, in which the Facility forms part of a collaborative European consortium. The action is entitled “Native Mass Spectrometry and Related Methods for Structural Biology” (Action BM1403). The second is grant PRB3 (IPT17/0019 - ISCIII-SGEFI / ERDF), as a member group of Proteored, PRB3-ISCIII. Please also see the selected publications section where the scientific contributions of the Facility are listed. The services offered include MS, MS/MS and MSn analysis using atmospheric pressure ionisation techniques (electrospray and nanoelectrospray) coupled to LC, nanoLC or infusion inlets. The capacity of the Facility was significantly strengthened by the acquisition of a new generation tribrid mass spectrometer that includes a quadrupole, a linear ion trap, and an Orbitrap mass analyzer. This instrument allows multiple fragmentation techniques—CID, HCD, and ETD—during any stage of MSn, with subsequent mass analysis in either the ion trap or Orbitrap mass analyser. The instrument takes advantage of the combination of a brighter ion source than previous Orbitrap instruments, with a higher capacity transfer tube and an electrodynamic ion funnel for increased sensitivity. It is provided with an advanced active ion beam guide for improved robustness, a segmented quadrupole, and improved ion transmission and ETD performance. Advanced vacuum technology allows tuning of the vacuum in the IRM cell to improve ion transmission and S/N for intact proteins, as well as for their fragmentation. 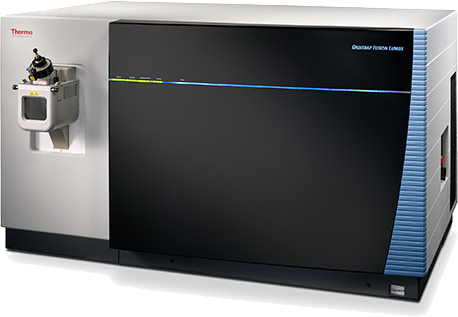 This instrument is used in the most challenging applications in proteomics, both in Top-down and Bottom-up approaches. It is used coupled to two nanoLC systems depending on the MS approach: a Dionex Ultimate 3000 nanoLC sytem (Thermo) or a NanoAcquity UPLC from Waters. A chip-based nanoESI interface (Advion Triversa Nanomate) is used in both cases. LTQ FT Ultra (Thermo Scientific) (2007). Hybrid Mass Spectrometer consisting of a linear Ion Trap, combined with a Fourier Transform Ion Cyclotron Cell. It is also provided with ECD and IRMPD for complementary protein fragmentation in the mass high throughput spectrometer. This instrument provides high-resolution MS data for high throughput Top-down MS protein analysis and Bottom-up MS applications. It is used in two different configurations to allow a wider range of MS applications: a) coupled to a micro LC device (Surveyor LC (Thermo) and a chip-based nanoESI interface (Advion Triversa Nanomate); and b) coupled to a nanoLC system (NanoAcquity UPLC, Waters; purchased in 2009) and the chip-based nanoESI interface. Synapt High Definition MS System (Waters-Micromass) (2007). Hybrid QTOF instrument with an incorporated Triwave Cell. This instrument allows tandem MS to be combined with ion mobility, thus permitting the analysis of samples differentiated not only by their mass to charge ratio, but also by their shape and size. The instrument is used to analyse the macromolecular structure and conformation of intact proteins and to study non-covalent interactions. When working in its normal configuration, the instrument is attached to a chip-based nanoESI interface (Advion Triversa Nanomate). SAW MS-I (developed instrument from collaborative work between SAW Instruments (Germany) and the University of Konstanz (Prof. Michael Michael Przybylski, Germany) (2014)). The SAW-affinity biosensor with online ESI–MS enables direct structure determination and quantification of affinity bound ligands from a biopolymer-ligand complex (Kd determination), using a Surface-Acoustic-Wave (SAW) biosensor. Contact the MS team. We advise you on the best analytical methodology for your specific application. One of the most important steps to achieve a successful result in mass spectrometry analysis is a well-planned experiment involving an adequate sample preparation for each MS analysis. Specially, for proteomic experiments is strongly recommended to contact with MS team before starting it. Here you have some general instructions, but do not hesitate to contact us for any doubt. Avoid keratin contamination by using gloves and lab coat. Do not use autoclaved material. Wash all the material with milliQ water and MeOH (high quality) and let them dry before use. If possible use low-binding eppendorf. Use simple and well-recognized tube labeling. We recommend using consecutive numbers. When possible run a 0.75 mm thickness gel. Use clean recipients for staining. Close them during staining period to avoid contamination. NEVER use recipients that were previously used for Western blot. Use a mass spectrometry compatible protocol for gel staining. If you use fluorescent stain do not cut the bands manually by using a transilluminator. Cut only the stained region. The higher protein concentration and the lower acrylamide presence, the better protein identification. When possible cut the gel spots or bands in a laminar flow hood to avoid keratin contamination. Store bands at 4ºC without water or other solvents. There are some reagents not compatible with mass spectrometry. Below are listed the most commonly used and not compatible with LC-MS. Please tell us the reagents you use for sample preparation. Igpal/NP40 is almost impossible to remove and shows large polymers along all the chromatogram, so we will suggest changing it for N-octyl-β-glucopyranoside or avoiding any detergent if possible. The RNAse is a protein that could mask the proteins of interest. For IP experiments a negative and a positive control are needed to find out nonspecific interactions. We also recommend running a SDS-PAGE gel with 10% of the sample to have an idea how the IP works. The amount of sample required for protein identification depends on sample complexity and purity. For complex samples at least 1nM is required. Denaturing conditions: proteins are solubilized generally in a 1:1 mixture of acetonitrile/water or methanol/water and 1% formic acid is added to enhance ionization (all solvents must be MS quality). Depending on their purity, proteins are analyzed by infusion or by LC-MS. 1μM to 10 μM protein concentration is required (volume: 10-100 μl). Low dynamic ranges are normally achieved and pre-purification is therefore required. Non-volatile salt removal is necessary (Zip-tips can be used). Maximum non-volatile salt accepted in the case of LC-MS experiments is 150 mM. Infusion experiments require complete salt removal. Non-denaturing conditions: proteins or non-covalent protein complexes are solubilized in NH4OAC (10mM-1M). Salt removal is imperative and is done normally by dialysis or with Biospin columns. 5μM to 50 μM protein concentration is required. Top-down (MS/MS experiments) can be performed on intact proteins to localize modifications or confirm amino acidic sequence. Protein length is limited to 30 kDa to perform MS/MS in the gas phase with the aim of entirely sequencing the protein. Middle-down strategies are otherwise used. Denaturing conditions are used in this case. 5μM to 10 μM protein concentration is required (100 μl). Submission to the technician-run service by filling in the sample/s request form (available here or in the MSC lab). Self-service (open-access) systems. Only for researchers qualified and trained to operate the mass spectrometers. If you plan to use the MS service often and would like to be considered for training, please contact Dr. Marta Vilaseca. When filling the request form, your sample or set of samples will be identified by a code number (apart from the users label). Depending on the analysis requested it will be classified in the corresponding "to-run" folder for each instrument. The sample will be also classified and kept in the conditions specified in the request form. If preferred you can keep your sample and bring it a day before the beginning of analysis (following scheduled dates). There is a calendar (contact the facility manager) for each instrument and submissions will be ordered by time of entry (IRB Barcelona groups are given preferential treatment). Users can reserve a week in a specific instrument for long application (maximum 2 full weeks per user, depending on demand). Between long time applications we always reserve a week to perform shorter analysis in order to avoid delays. Mondays (or a pre-specified day) are reserved for the maintenance of the equipment and set up of the required technique pretended to use that week in each instrument. Results performed by MS staff will be given in printed format (spectra and report specifying analytical conditions). Digital format data can also be kept if requested. If further processing of your results is required a computer will be reserved in the facility for this purpose. Our future goal is that users can also access data via a secured network. Data will be transferred to a common-server and back-ups will be performed automatically by the ITS Department. Data will be kept for a maximum of two years. Plataformas de apoyo a la Investigación en Ciencias y Tecnología de la Salud de la Acción Estratégica en Salud 2013-2016, Instituto de Salud Carlos III, pudiendo estar cofinanciada con cargo al Fondo Europeo de Desarrollo Regional (FEDER).